Looking to go green by reducing or replacing catalogs around the office? Promotional item vendors are starting to produce apps for use on smart mobile devices like the Apple iPhone and Motorola Android. Let us humbly call it a small win for the planet. Since the beginning of the promo industry it seems that paper catalog has been the platform of choice for communicating to and with clients. Yes the internet made catalogs a bit less necessary, but for on-the-go information and simple browsing, the paper catalog is still the go-to resource for a lot of people. I think apps might challenge that paradigm and in the process save a heck of a lot of trees, ink, fuel, postage, and time. Like paper catalogs, apps place the experience back into the hands of the user. So far it seems the industry is developing two types of apps, one for before the sale, basically a catalog, and one for after the sale, designed to help the end-user interact with the promotional item itself. The Mobile App From Logomark is an instance of the fist example, and likely what we will see most of in the coming months. 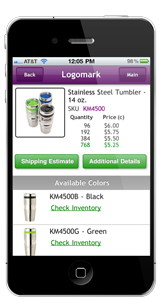 The Logomark app basically gives the user, any user, access to the complete Logomark catalog. This is a great tool for event planners – and others – as they can actively use the app in their planning at the event site itself, working with their client to see what products match the event location in real-time. No catalogs, no emails, just the data right there in your hand. The second type of app is actually something newer and I think more interesting. Companies such as WOW: Branded Personal Assistance, home of the WOW card, are using mobile apps to allow end-users, i.e. those given the WOW card as a promotional item, to communicate with WOW’s live concierge service via email, text, MMS, or voice at a touch, all on the same standard or better yet customizable client branded app. The app is currently available on the itunes store, with versions for other platforms in the works. Anyone can download the app itself, but it is not going to work for them unless they already have an active WOW account. The service from the folks at WOW has always been impressive, but being able to offer a client a branded concierge service via a customized app is just plain cool. Sign up for a test account if you want to try the service for yourself. As 2012 gets under way expect to see more and more vendor apps available to both distributors and likely the general public (if they know where to look). If you are ASI and looking for more information on Logomark contact Dustin Smith. If you’re thinking about custom client apps for the WOW card contact Chris Jenkins. If you are looking at Logomark items or the WOW card to support your own business, contasct your local promotional items vendor or email info@proformagreen.com.